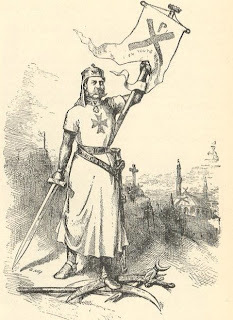 Thomas Nast, America's greatest carica­turist, and one of the greatest caricaturists of any time, who died at Ecuador (where he was serving as United States consul) on Decem­ber 7, 1902, was born in Landau, Bavaria, in 1840, and was brought to this country in 1846. His first employment as a newspaper draughts­man was on Frank Leslie's Illustrated Newspaper. He went, abroad, in 1860, as a special artist, to depict the Heenan and Sayers prize fight for the Illustrated News. 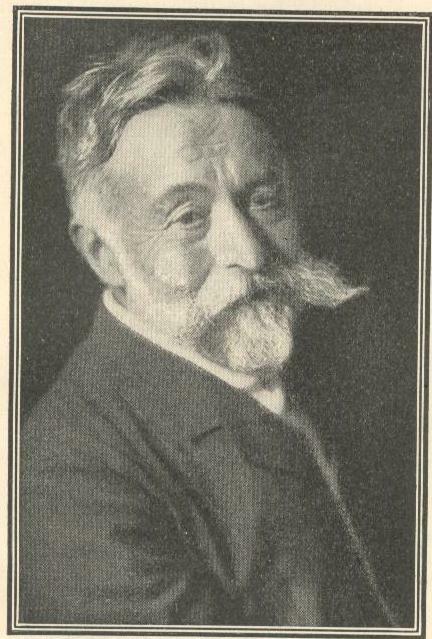 In 1860-61, he was with Gari­baldi, furnishing sketches of the Italian cam­paign for English and American periodicals. In 1862, he joined the staff of Harper's Weekly. In the breaking out of the war, he began to make cartoons of so graphic a nature that he was soon exclusively employed as a caricaturist. His cartoons made from 1802 to 1870 were rather graphic portrayals of events and situa­tions than political caricatures. It was not until about the time of the Tweed Ring exposure, 1871-73, that his special bent toward individual characterization made itself felt. In the caricatures of Tweed and the rest of the "Ring," Nast's vivid characterization, united with his ability to portray a situation, made his cartoons one of the most potential fac­tors in the overthrow of the "Ring's" supremacy. 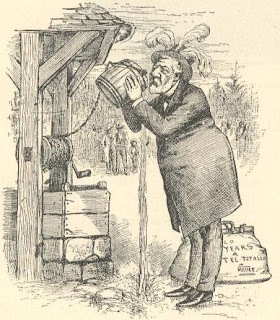 In 1872, Nast's pencil was directed against the candidacy of Horace Greeley, and a picture of Greeley washing the "Tammany Tiger" gives us perhaps one of the earliest effigies of that now famous feline, which Nast, it is said, invented. In antithesis to the Tammany tiger, he also invented the Republican elephant, In 1873, after Grant's second election, Nast aimed his sarcasm against the "third term" outcry (mainly echoed by the Herald),—"Caesarism," as he termed it,—and pilloried James Gordon Bennett un­mercifully. Tilden, who was the next Aunt Sally at which Nast flung his trenchant missives, was represented as a feeble old man holding a rag baby in his lap,—this dummy was typical of paper cur­rency, But the caricatures of Tilden were not so strong as those of Tweed, nor as those he made of the later Tammany leader, John Kelly. 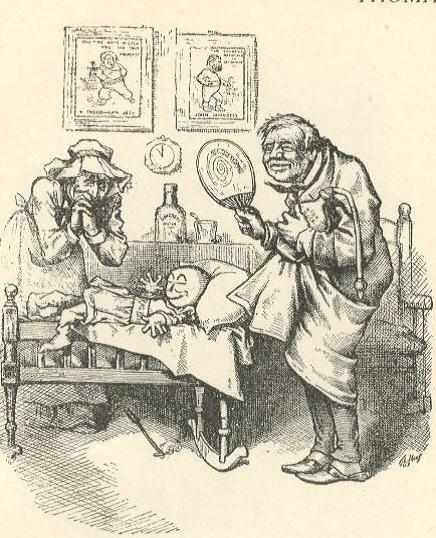 In 1880, Hancock came in for a goodly share of the artist's satire. In 1884, for the first time, Nast's pencil was directed against the Republican candidate; he supported Grover Cleveland, caricaturing Blaine. But he was not at home in assailing a Republican candidate, and his effigies consisted of little more than the stalwart Blaine, with three white feathers in his high hat, and printed labels introduced into the back­ground that were more than mere allusions to the candidate's alleged venality. 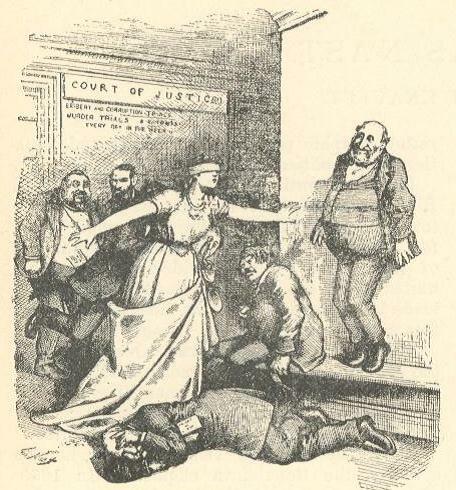 The Blaine-Cleveland campaign was the Last in which Nast drew for Harper's Weekly. He severed his connection with that periodical in 1887. His career was then virtually ended, though he later drew intermittently for other journals. 1n addition to his vigorous service during these campaigns, Nast attacked many problems of national and international importance, and took sides in the different issues as they came under the consideration of Congress and the people. In his simpler cartoons of some foreign situa­tions, as the strained relations of the English lion and the Russian hear, Nast was at his best. His single figure of the Czar Nicholas, which we reproduce, is quite equal in poignancy to and more colorful than, similar monumental car­toons in the London Punch. 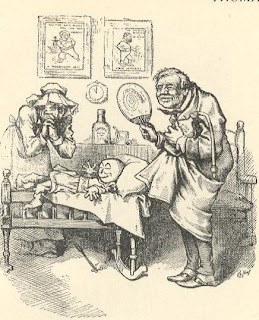 Nast's supremacy as a cartoonist lay in the fact that he could meet Tenniel of Punch on his own ground, in a simple cartoon, and yet excel him in more com­plex caricatures. 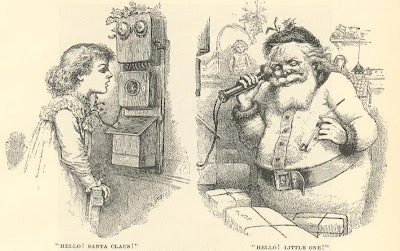 Nast was not always employed in fierce po­litical attacks, but prepared for the Weekly, and sometimes for the Bazar, charming conceits in a lighter vein anent the festive Christmas season, the dawning of the New Year, or bright Easter Day. Of such is the “Santa Claus" we reproduce. His portraits were mainly political, and be­sides those in his Presidential campaign cartoons, the physiognomies of Henry Watterson, Wade Hampton, Ben Butler, Carl Schurz, Abram S. Hewitt, Judge David Davis, and Tom Reed figure many times in his designs. Nast's activity ended before Roosevelt became a power to be reckoned with in the political arena, but it is interesting to reproduce an 1884 cartoon in which Roosevelt (who appointed Nast to his consulship in Ecuador) is portrayed by the veteran artist's pencil. We fancy that Nast originated his subjects to a greater extent than did most caricaturists. In the case of Tenniel, for instance, ideas for his cartoons were suggested by any of the editorial staff whose brain happened to strike fire at the weekly Punch dinner. For years he made a regular trip from Morris­town, N. J., where he lived, to the Harper estab­lishment, in Franklin Square. 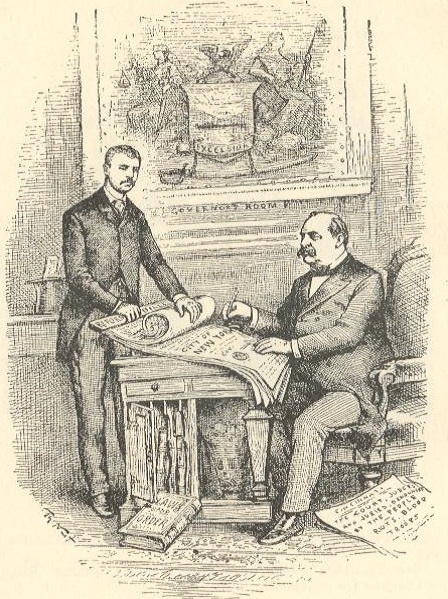 There, with the editor, George William Curtis, and several mem­bers of the Harper firm, a conference was held, and the designs for the week passed upon. Some­times the artist's designs were turned down. He has drawn a picture of himself on trial, as it were, before this august tribunal. The composi­tion used to hang in one of the Harper editorial rooms; we do not know whether it was ever published or not. In the eighteenth century, in English carica­tures, it was the custom to draw from the mouth of each personage a line ending in a loop, in which were written the words the characters were supposed to be speaking. Nast rarely resorted to this artifice, but instead (he might be said to have almost invented the custom) intro­duced verbal adjuncts that helped to carry many cartoons. We have in mind the labels that be­sprinkled his backgrounds. These were frequent­ly quotations from speeches or editorials of the opposite party, lettered freehand or set up in type, and placed upon a fence or a door-jamb, or in any available place. It has been reported that Nast's salary with Harper & Brothers, for many years, was $10,000, at that time the largest salary that had ever been paid to a caricaturist in this country. Since then, however, caricaturists have received, we believe, as much as $15,000, as the salaries in journalism have greatly increased during the last, decade. For several years he published Nast's Almanac, illustrated by his pencil solely, but containing articles by well-known humorists, such as Bret Harte and Josh Billings. He illustrated a few books not very success­fully; and some pamphlets which met with phe­nomenal success. One, attributed to the pen of Richard Grant White, was entitled "The New Gospel of Peace;" another was "The Fight in Dame Europa's School," by the Rev. Henry Williams; and another, Robinson Crusoe's Money," by David A. Wells. He was in frequent demand as a lecturer, illus­trating his talks with caricatures made with great dexterity before the audience. Perhaps one of the most successful of Nast's cartoons appeared when, toward the end of the was (September 3, 186-1), there was a talk of com­promise; he made an appealing design, repre­senting the negroes being brought back to slav­ery, the legend reading, "Compromise with the South—Dedicated to the Chicago Convention." The most successful of his Tweed regime car­toons was that representing the "Ring" stand­ing in a circle, pointing one to the other, and each one saying ("’Who stole the people's money?’ —Do Tell. "—New York Times). 'Twas him." All during his career, but more especially at the end, Mr. Nast devoted part of his time to oil painting. Some of his paintings are en­titled: "Departure of the Seventh Regiment for the War (1861)," "Lincoln's Visit to Rich­mond," and "The Civil War (1861-65)." In 1879, the officers of the army and navy presented him with a silver vase in honor of the service his pencil had rendered the nation. Nast received little or no art education. When a boy, he was doorkeeper in an art gallery, and was allowed to make copies of the paintings; he was in the drawing classes of one Theodore Kaufmann for six months; but he once told the writer of these notes that his knowledge of draw­ing was gained mainly through copying, over and over again, from Harding's "Drawing Copies." It has been said in frequent criticisms that Nast was a poor draughtsman. With this judgment we do not agree. Perhaps the only carica­turists who have really been first-class draughtsman, from an artistic point of view, are the Frenchmen Daumier and Forain; Gillray, Hogarth, Chain, Cruikshank, or John Leech could never have passed an art school examination; and while it is true that Nast did not draw with that abandon, that easy freedom, employed by the best French caricaturists, yet his method (which was more like that of Hogarth) was one of uncompromising realism, that allowed him to delineate a ballot-box, a high hat, an officer's uni­form, a sword, a bayonet, or a skull so that there was no mistaking it for anything else, and his portraits were speaking likenesses. His method of cross-hatching, though it gave a maximum amount of work to the engraver, was admirable from two points of view. In the first place, it allowed the block upon which Nast drew, which was composed of small pieces of boxwood locked together by keys at the back, to be distributed among a number of workmen, so that one of his largest cartoons could he fin­ished almost as quickly as one engraver could cut a square inch. Then, again, his cross-hatch gave a maximum amount of color to his designs. It might be said that no other caricaturist ever obtained so much color in his designs as did Nast. On account of their richness of color, it was gener­ally supposed Nast drew with a pen (as he fre­quently did after 1885, when his work began to be reproduced by photo-engraving), but that is not the case. The majority of his designs were made with a lead pencil, being drawn on box­wood in reverse. From the American Review of Reviews, 1903.